The government is paying whistleblower rewards for reporting GSA fraud or fraud against any government program. National Report General Service Administration (GSA) Fraud Day is officially celebrated on March 6 each year. The purpose is twofold. First, National Report General Service Administration (GSA) Fraud Day brings awareness to the amount of fraud committed against the GSA government program. Second, it highlights both the need for whistleblowers and that significant rewards are paid for reporting GSA fraud. Ten percent of all government spending is lost due to fraud. * That adds up to $350 billion a year. To combat fraud, the government has turned to whistleblowers for help. The U.S. Department of Justice (DOJ) has a whistleblower reward program that pays up to 30% of the funds recovered based upon allegations that someone cheated the government, including GSA fraud or fraud against any government agency or program. How to celebrate National Report General Service Administration (GSA) Fraud Day? The best way to celebrate National Report General Service Administration (GSA) Fraud Day is to learn about the government reward programs by visiting Mr. Hesch’s website, and then contact an experienced whistleblower reward attorney to find out if you have the right type of case eligible for a reward for reporting GSA fraud. In addition, tell others of National Report General Service Administration (GSA) Fraud Day so they too can help stamp out fraud against the government. The government pays whistleblower rewards for reporting fraud against the General Service Administration (GSA) through schemes to conceal and deprive the government of their best prices. Frequently, the General Service Administration (GSA) or other agencies require a contractor or supplier to provide the government with the best price it charges to other customers, known as GSA best price fraud. This obligation requires companies to tell the GSA if it later gives a discount to another company at a lower than the price the GSA paid. Because this fraud is hard to detect by GSA, the government is paying sizable rewards for reporting GSA Best Price Fraud. Congress passed two laws prohibiting contractors to sell goods or supplies through the General Service Administration (GSA) to governmental agencies if they import products from certain countries. Specifically, the Trade Agreement Act (TAA) prohibits a contractor to sell goods or supplies through the General Service Administration (GSA) to governmental agencies if they are imported products from countries, such as China and Taiwan, that don’t have reciprocal trade agreements with the United States. In addition, if a government contract contains a Buy America Act provision, it prohibits all goods from any country. The GSA purchases large quantities of products for the various federal agencies. If the company violates either of these laws, it may be liable for damages and the whistleblower awarded a portion of the amount collected. This applies to direct contracts with the military or any agency, as well as listing products on the GSA website. 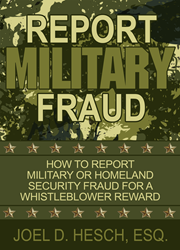 Free E-Book for reporting GSA fraud or military fraud) and receive a monetary reward? To help whistleblowers properly report GSA fraud (or military and other types of government fraud), Mr. Hesch authored a free-ebook on obtaining rewards for reporting fraud against the government. You can learn more about reporting GSA fraud, military fraud, or Medicare fraud for a reward by visiting Mr. Hesch’s website (http://www.HowToReportFraud.com).